My blog is about bikes—in particular the F800GS—so this entry is, in itself, suffering from something of an identity crisis. My career has spanned 22 years in the field of corporate graphic design with a focus on brand identity. The graphic design industry has developed something of a bad name, with inexpensive, powerful computers and software available to anyone fancying themselves a bit of a designer from their basement... so opinions vary and everyone certainly has one. I am of the opinion that automotive design is the pinnacle of the industry. 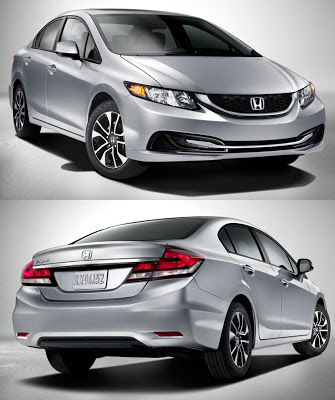 Where else does design combine aesthetics, engineering, safety, comfort, dynamics and economy? I have a huge appreciation and a great deal of respect for the blood, sweat and tears that go into every detail of a modern vehicle. Which brings me to Honda. A company close to my heart, having owned 3 of their cars and 2 of their bikes through the years. Considered by many to be one of the finest engineering companies in the world, their cars are well known to be among the most reliable, and their engines among the most durable. Honda's styling is a different matter, however. Through the years they have had some incredible design hits, such as the then-futuristic 1988–91 Civic and clean-cut 1990–92 Accord—both designed to showcase their expensive and compact double wishbone suspension using design cues such as impossibly low beltlines. So what happened when they redesigned the 9th generation Civic? The styling was such a disaster and an offence to the eye that the refresh scheduled for its 4th year was brought forward 3 years (pictured). Despite this, it still lacks the coherent, clean styling of its predecessor and gained frumpy proportions, awkward angles, and a flabby set of tail lamps straight off a Taurus or Camry from a decade ago. The gobs of plastic chrome on the front and rear are out of place with the black trim on the sides. The window line is disturbed by a black triangle of plastic on its leading edge where a single window lived previously. The stance is somehow wrong, looking almost as though the wheels have a negative camber—shaky knees. This is worsened by the increased overall length and decreased wheelbase compared to the previous generation. It looks a bit pants. In my opinion the 8th generation Civic is one of Honda's more recent styling hits, particularly the Japanese/European version. Ignoring the shopping trolley handle rear wing specific to the Type-R (pictured), the design is clean and tidy, and the shape flows harmoniously from front to rear. The plastic chrome above the front intake fits well with the design and doesn't look like a pretentious attempt to move the car further upmarket. It brings to mind the spirit of the 4th generation (1988–91) with its short front and long cabin. Honda never quite managed to capture this spirit with the 5th, 6th and 7th generations. The flowing profile is offset by round detailing in the headlights, tail lamps, fuel filler cover and the wheels themselves, coming together to give a sense of stability and strength. The face is slightly aggressive without being offensive—the slim headlights widen the appearance of the front end and the rearward curve toward the wheels emphasises and makes a feature of the short engine compartment. The design is tight and sorted, with none of the frumpiness of its successor. All is not lost with the 9th generation. Although the hatch version is also a questionable bit of design with some dumpy proportions, it seems Honda is listening—the upcoming tourer (pictured in concept form) loses the bad bits from the hatch and is, to my eyes at least, distinctive, flowing and harmonious on the whole, although some details such as the front air intakes are a bit fussy. 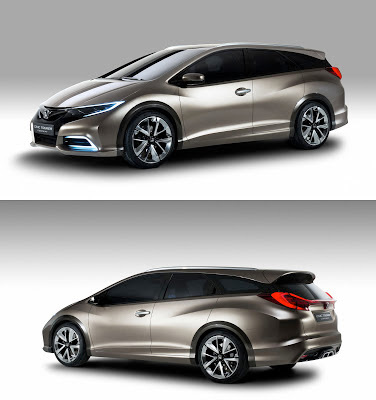 Honda's transition from concept to production traditionally consists of different wheels and lighting details, so what you see here should be virtually indistinguishable to the real thing. In Europe, medium sized estates sell well and Honda may just have a sales hit on their hands. I like some of the details such as the hidden rear door handles, which give the car a style reminiscent of a shooting brake, and the 3D tail lamps. The curving upper window line and bulging wheel arches effectively mask the fact this is actually cargo-carrying box on wheels. Overall, Honda have managed to turn a utilitarian class of vehicle into something fairly desirable. It will be interesting to see how the low end models with clear windows and small wheels ruin the design, but in Britain it shouldn't be a problem since buyers tend to spec up to the biggest wheels available. I still question what happened to the disaster that is the saloon/sedan model. It's difficult to imagine the two cars are the same vehicle underneath the bodywork. Instead of continuity between the two, it is as though two teams of designers set to work in their own bubbles, completely isolated from each other. 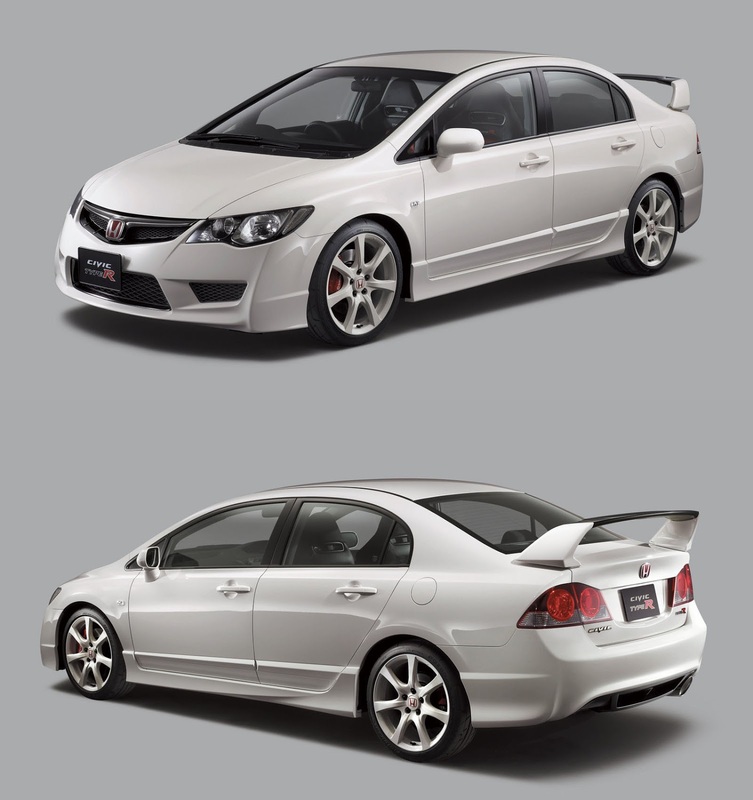 Time will tell, but I for one hope Honda go back to their roots and start designing iconic cars again. Cars which complement their incredible engineering and still look good 20 years on.